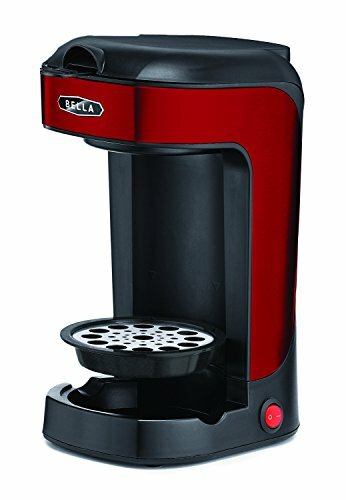 With it's compact design and sleekish design, the BELLA One Scoop One Cup coffee and tea maker will be your best friend in the mornings. Operation is simple. Just add your favorite ground coffee or loose leaf tea, press the button and in minutes you will be enjoying a perfect cup of bold coffee or tea. The adjustable height drip tray accommodates a variety of mugs and travel tumblers, so you can enjoy your coffee at home or on-the-go! Additionally, brew hot water for a variety of every day needs such as oatmeal, instant soups, hot cocoa and more. A great choice for smaller kitchens, offices, and dorm rooms, the One Scoop One Cup Coffee Maker has a compact, streamlined design that won't clutter your space. Its smaller footprint also makes it easier to store in a cabinet or pantry. With this coffee maker, you'll never need disposal paper filters. The permanent filter has a removable brew basket that collects the used coffee grounds, so you can toss them in the garbage.